Comic: "Not Brand Echh 1-13"
Plot: Marvel parodies it's own heroes, it's competition, and various other pop culture phenomena, and introduces the world to Forbush Man. Review: The title “Not Brand Echh” was a direct response to the question raised directly above it; “Who says a comic has to be good?” The joke itself is now an artifact of history, but when the magazine came out, advertisements never referred directly to their competition. A brand of Peanut Butter, floor polish, laundry detergent or anything else might be described as ‘better than the leading brand’ or more frequently ‘better than brand X’. Since ”Not Brand Echh” lifted its style almost directly from Mad Magazine, “X” became “Echh”. Mad Magazine was damn good back then. It was just coming out of it’s Golden age, first as an EC Magazine, then after the comic book purges of the fifties as the early Mad Magazine. That early version was all in comic book format, although there were multiple features per issue. I’m sure I’ll write something about in the future, but for now, lets just say it was the funniest thing on the newsstand, utterly unique and a huge landmark in the history of modern comics and comedy. “Not Brand Echh” was an imitation. One might even go so far as to call it a rip-off. They even had a Mascot, ala Alfred E. Newman, the mighty Forbush man. (Incidentally, the second hero ever to wear a pot on their head as a mask. Big trivia points to anyone who writes in with the name of the first). But, see, Mad was so amazing that a reasonably crafted rip-off was pretty damn good. Especially when you consider that the Marvel staff were not professional comedians. Plus, it was targeted. Where Mad parodied specific comics now and then, “Not Brand Echh” almost exclusively featured super hero parody. The name changes were amusing, but standard fare. “Charlie America”, “The Mighty Sore”, “Knock Furious, agent of S.H.E.E.S.H”, and of course “The Echhs Men”. The comedy, however, could be pretty darn good. When The Revengers discover Charlie America floating in a block of ice and thaw him out, Sore says, “I am Mighty Sore”. Charlie responds “Me too, Lady. Have you got any Excedrin?” That’s some quality patter right there. The book could also take on a challenge. A memorable parody of “West Side Story” featured Marvel and DC heroes as the opposing gangs and didn’t shy away from Mad style ‘sung to the tune of’ song parodies. The book only ran 13 issues, one of them being mostly reprints. I don’t know why, but I suspect quality comedy proved to be too hard. A super hero book with mediocre writing might be carried along on the popularity of its characters. Comedy has only the writing, and if it isn’t good your audience won’t come back just to ‘see what happened to the characters.’ There’s no soap opera factor. If the X-men had to be good all the time, how long would it have run? Marvel would try comedy again, but never do anywhere near as well. The one shot TV parody “Spoof” was something I bought but have no memory of beyond the cover. At one point in, I think, the Eighties, “Not Brand Echh” was briefly re-introduced. The reprints were pretty cool, but the original material was awful. Same for the short lived “What th-“ Which was pretty much “Not Brand Echh” with a new name. 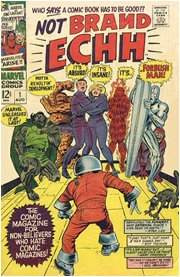 I think “Not Brand Echh” was as good as it was because it was written and drawn by the Marvel Bullpen, a handful of writers and artists all of whom had been there at the birth of the comic book industry, a time when any pro was expected to be able to do any genre. Romance, Western, Sci Fi, Horror, Super Hero and yes, from time to time, comedy. Almost none of today’s writers have that kind of range. Hell, a lot of today’s specialist writers can hardly write the stuff they specialize in. Print comedy itself is an all but forgotten art form, with Mad Magazine a sad shadow of it’s glory days and as far as I know, the sole survivor of newsstands. Here’s hoping it comes back in style. I could use the work. It was the original Red Tornado who wore a pot as a helmet. YOW! Correct and quick! Answer me this though, did you know that from the current run of JSA, or are you a true comics dork? I don't think print comedy necessrily died. I just think all the best of the print comedy crop are doing their thing on the internet instead of the more traditional printed periodicals. but it's just about on par. I know it has nothing to do with the subject, but this article reminded me of the "What If..." comics with the Watcher(s) giving alternate timelines and story archs. For example, one issue would be "What if Jean Grey never became Phoenix" or "What If Bruce Banner never became the Hulk", etc. I don't know why, but that just popped into my head. 'Nuff Said. How long ago are these from? I'd like to read these. "It was the original Red Tornado who wore a pot as a helmet." I was going to say Don Quixote, but does he not count as a hero? DQ wore a shaving bowl, and I do not think he counts as a superhero. Not Brand Echh ran in 67 and 68, so we're talking some time ago. I am, in fact, a comic geek. For example, the Red Tornado we are referring to is a woman. When I saw the title, "Not Brand Ecch", I thought it was a Mad parody special that they've done from time to time. While I haven't read the rag in many years, I used to grab one while shopping with my grandparents, I wouldn't think that they've tamed or decreased in quality through the years. They've just changed along with the audience. It also seems that the source material that they spoof these days is getting easier and easier to crack on because the quality of the film and television industries has suffered greatly through the decades. I mean, how good can a spoof of a basically spoof be? Ever crack jokes about Police Squad? I just think that back in the day, they had to TRY to make jokes and funniness. Except for their political spoofage, those guys have always been right on the line of idiocy and ripe for satire and parody. Oddly enough, Forbush Man showed up in Nextwave, recently. He had some form of mind-control powers and would make people see their worst nightmares, I believe. However, his mind powers didn't work on Tabetha (Boom-Boom, Boomer, whatever) because she didn't have a mind, lol. Nextwave was so wacky. We need a review of that sometime soon, because its pure unadulturated insanity. Yes, DCD made some awesomely obscure choices for their Minimates! There is even a Lobo and Ambush Bug two pack!